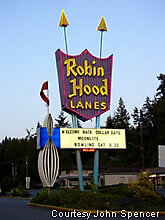 Robin Hood Lanes in Edmonds, WA features a sign with a pin that's cut in an interesting shape. Here's an old deco building housing Interstate Lanes of Portland. 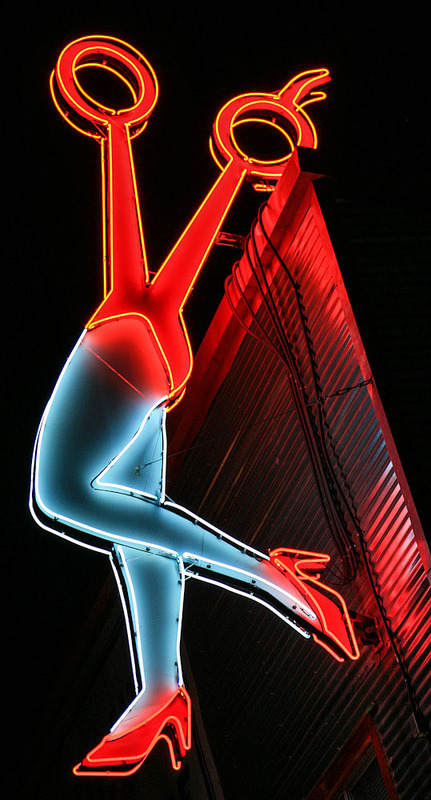 This old time bowling alley sign is located at Medford Lanes in Oregon. Check out the bowling ball that looks like a happy face atop the sign. The lettering on this star shaped sign features the look of the mid-century as it captures the attention of motorists passing by. Indian Lanes in Roseburg, OR still features the classic look of the old time ten pin alley palace. (Far left) The marquee still stands tall in the shape of a pin. 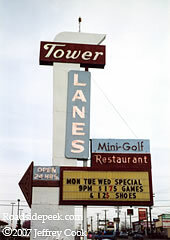 For more information on Tower Lanes, see the Tower Lanes website.